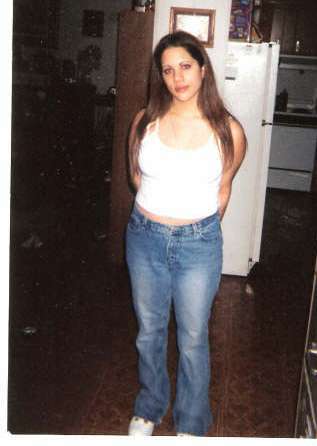 My daughter, Melissa Romero, 22, was shot to death in her home at 302 E. Reed Street in Roswell, New Mexico, on April 15, 2006. Cmdr. 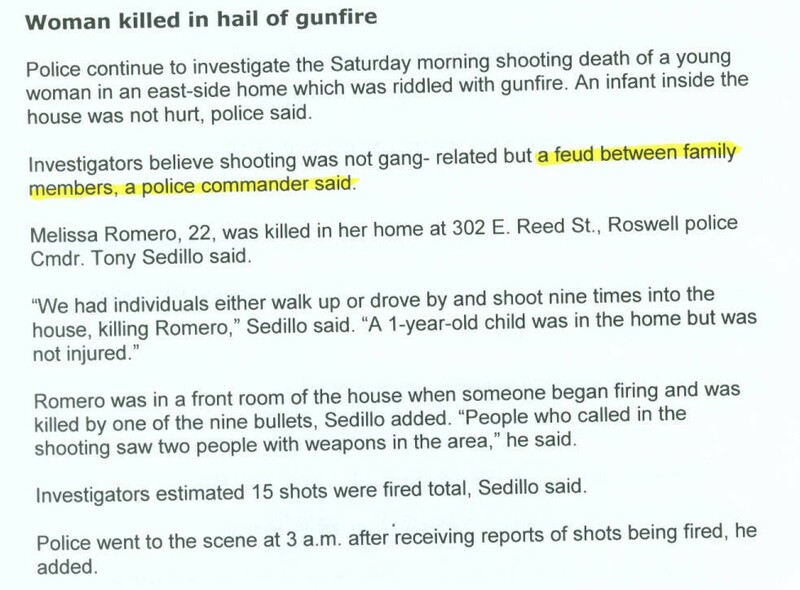 Tony Sedillo of the Roswell Police Department told reporters, “We had individuals either walk up or drive by and shoot nine times into the house, killing Romero," whose body was found in the front room of her home. Eric's official accounts of that discovery differ. In the coroner's "First Notice of Death" report, completed at the scene, Eric is quoted as saying that he and some friends were driving around, listening to the police scanner. When they heard that shots had been fired in the 300 block of East Reed Street, they rushed to the house. However, two hours later, Eric changed his story. He told police that, at 3:15 a.m., he was called at a "getting out of prison party" for a friend named Ricky Salazar by another friend, Tino, who had heard about the shots on a scanner. One thing I found odd when I arrived at their home that morning was that Eric and Melissa's Yukon was parked so perfectly in their driveway. I drive a Jeep, and even I would have had to slow down in order to pull in carefully between two fences. My Jeep is a lot smaller than the Yukon, and I thought it strange that Eric would take time to position his car in the driveway if he thought Melissa might have been in the house, shot. He was right! 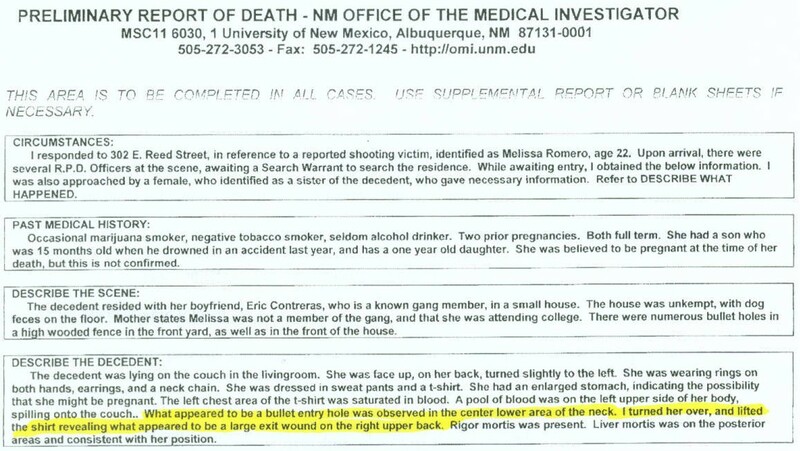 The original autopsy report did state she was shot in the neck. The police, coroner and OMI all agreed on that. 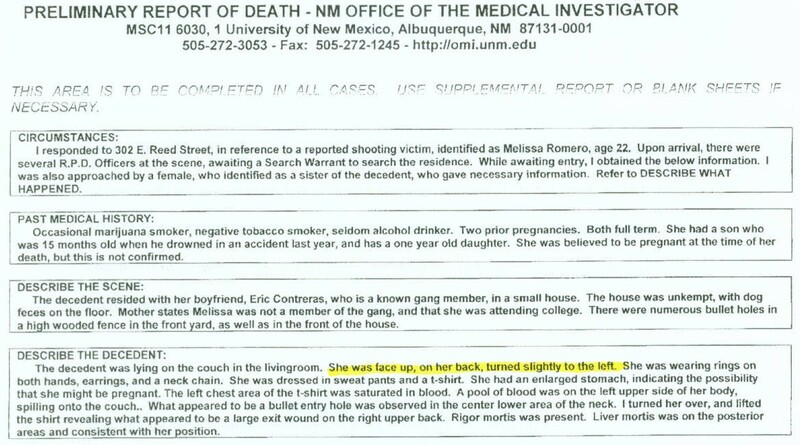 The report was reissued seven months later and altered to say she was shot in the neck/back, based on Eric's statement that he found her with her back to the door. The hole in her neck was very small and round, suggesting an entrance wound, and the hole in her back was large and jagged, suggesting an exist wound. The logistics were confused by the fact that Eric repositioned her body before police arrived. And I don't think he did that alone. In June of 2006, I told Eric’s mother that, since I did not get to see Melissa’s body until after the autopsy, I did not know if she looked peaceful, scared or was crying. His mom said to me, “Melissa looked very peaceful.” Eric's mother has told us over and over that her phone ringer was turned off and Eric could not get in touch with her after "finding Melissa's body." Supposedly she did not see Melissa at all until she went to Belen for the funeral. How could she have known the expression on Melissa's face unless she was there at the house before the police were? She has often stated that she would "do anything" to protect her children. Melissa’s twin brother, Thomas, had talked with his sister that afternoon, and Melissa had told him that she and Eric had been fighting all day. When I saw Melissa’s body at the funeral home after the autopsy, she did not have any bruising or swelling, but the next day after her body was embalmed, she had severe bruising on the left side of her face and her left arm. Eric had a violent temper and had been known to pull a gun on Melissa when she did not do what he told her. Eric didn’t call the police upon finding Melissa’s body. It was a neighbor who heard the gunshots and called 911. When police arrived at the house, Eric refused to let them in. Police told me they had to call for backup in order to enter. According to police reports, Eric and his cousin, Fred, started yelling at the police and calling them nasty and vulgar names. Fred actually tried to attack one of the police officers. Eric also told police there were no guns in the house; however, after they got a search warrant, they found guns hidden in the trash can in the kitchen. Weeks later, Eric took guns out of town and did not bring them back upon his return. Eric’s grief didn’t last long. Three weeks after Melissa’s death, he told us that he was moving in with his friend “Jim”, because Jim’s girlfriend had left him and their young son, and this way Jim and Eric could help each other out with the care of their children. Well, it turned out that Eric’s friend’s name was actually “Gem,” and she was a woman whose boyfriend was in prison. Eric would have parties at the house where Melissa was murdered, during which he would pull up the cushion on the sofa Melissa died on and show his guests the blood stains. Approximately five weeks after her murder, he called me to ask if I had gotten back Melissa’s jewelry from the Office of the Medical Investigator, or if I knew where Melissa’s other jewelry was, because he wanted it. In August, I became concerned for the welfare of my granddaughter – whom Eric and his mother wouldn’t allow me to see – and requested a Welfare check. The CYFD (Children, Youth and Families Department) removed both my granddaughter and Gem’s little boy from the house, because they were not being properly cared for and the house contained drugs and guns. While the kids were in state custody, the CYFD performed drugs tests on them. Both tested positive for meth. CASA (Court Appointed Special Advocates) told me the concentration of the drug was so high that both of the children must have ingested it directly. That means it was not inhaled in a room where others were smoking it, but was possibly residue on tables or in the bedroom, which was where CYFD found the drugs when they went to the house. 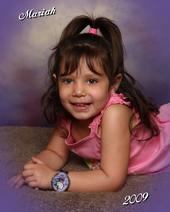 There was a guardianship hearing, and I was granted full guardianship of my granddaughter, who is now 4-years-old. 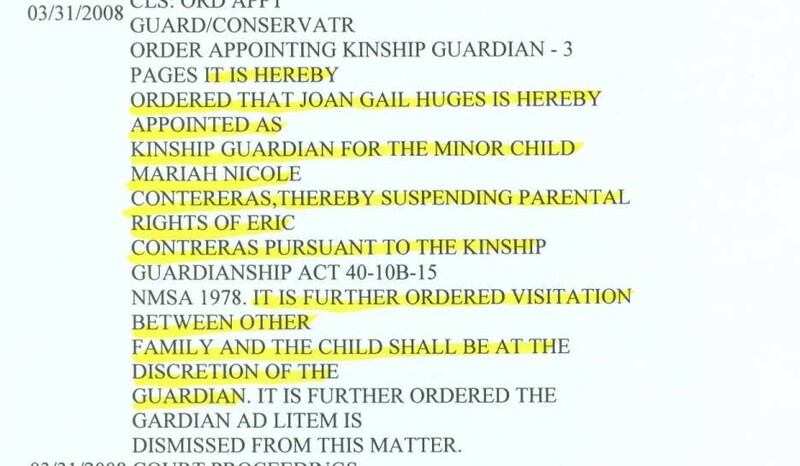 At that hearing the police, CYFD, CASA and Guardian ad Litem for the court all advised the judge not to let Mariah be anywhere near Eric and his relatives, many of whom were drug dealers and gang members. Eric has since served time in federal prison for illegal gun possession. He was recently arrested by the Federal Marshall, I believe for parole violation. At the time of this writing (Aug. 2009) he is locked up, awaiting a court date. In June or July 2009, Eric married one of Melissa’s friends. In 2007, this friend told me everyone knew Eric murdered Melissa and she was surprised he had not been arrested. Now that she and Eric are married, her story has changed to coincide with his. He claims the “East Side” gang did a drive-by that killed Melissa. However, there was no retaliation, even though several of Eric’s friends showed up the weekend after Melissa’s murder and told Eric, "We are going to go take care of this." Those friends were surprised when Eric told them no, not to do anything. The police even had extra patrols on the streets in anticipation of a retaliation shooting and they were surprised nothing happened. They told me that there was always a retaliation shooting after a murder of a gang member's girlfriend, wife or family. This supports our belief that Eric knows who murdered Melissa and it was not a rival gang. Many people have told us that Eric shot Melissa in the neck and the “drive-by shooting” was staged as a cover-up. However, those people are afraid to talk to the police. Seven times, starting within an hour of Melissa’s body “being discovered dead,” police have asked Eric to take a polygraph test, which he continues to refuse to do. Melissa’s case has now been transferred from the original detective, Jon Merideth, (who was all but unreachable to our family, because he was taking a Sergeant’s exam for a promotion), to Det. Lisa Brackeen. Det. Brackeen has worked hard on the case and keeps in touch with us. However, the information that she has been given by her fellow officers is confusing and inaccurate. The last time my surviving daughter and I were in her office, we saw information about Melissa’s case on her bulletin board, and it was nothing at all like what we’d been previously told. It did not correlate with what we were told was called in to Crime Stoppers or with what police told us happened when they arrived at the scene. Melissa was a wonderful daughter and a loving sister and aunt. Because of her deep love for children, she was going to school to become a pediatric nurse. She had suffered many losses in the course of her short life, including her natural father and beloved stepfather. She, then, fell in love with Eric, who had had a crush on her since childhood, and allowed herself to be sucked into his decadent lifestyle. I’m not going to pretend she was an angel, but she stopped all drug use the day she found out she was pregnant with her first baby, Eric Jr. When “Little Eric” was 15 months old, his parents turned their backs for a moment, and he toddled off the porch and drowned in an irrigation ditch. The pain Melissa experienced was excruciating. 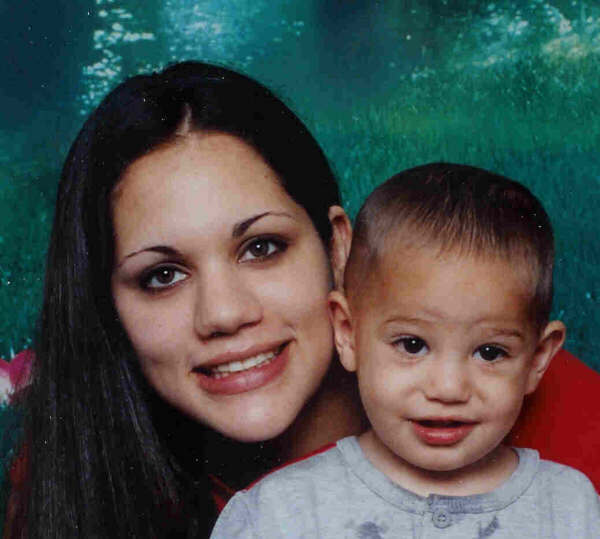 Much as she loved her second baby, Mariah, half her heart went into that grave with her little boy. It’s a comfort to our family to know she’s with her son now. But we need more than that – we need the truth about what happened to her. We have moved from Roswell to distance ourselves from Eric’s relatives, who are furious with me for trying to keep this case alive. People with information – and we know there are many of those – can reach us through Det. Brackeen at the Roswell Police Department, phone 624-6770, Ext. 175 or by personal e-mail sent via the Real Crimes Web site. Christmas, when we took Mariah to the shopping mall to see Santa, she asked him to bring her Mommy back to her for Christmas. Santa’s eyes grew teary when he told her that, even with all of his magic, he cannot bring back mommies who have gone to heaven.